*it would be best to see the film first, before reading this review. Writers: Alex Garland, Jeff VanderMeer. Cast: Natalie Portman, Jennifer Jason Leigh, Tessa Thompson, Jennifer Jason Leigh, Tess Thompson and Gina Rodriguez. Annihilation is a fantastic science fiction film. Developed from Jeff VanderMeer's first novel in a trilogy, the story for Annihilation was developed after one of VanderMeer's hikes. The film asks some of the deeper questions of existence: what does it mean to be human? And, is there something else out there? Viewers will have to come up with their own answers. But, VanderMeer's writings would steer you towards a higher power and not away. This is difficult material to dissect in a film review. So, it would be simpler to compare Annihilation to other films in the sci-fi genre, like Invasion of the Body Snatchers (1978) and Event Horizon (1997), before delving into the film's underlining spiritual message and central theme. Or, viewers could simply look at the film as an adventure into a new world, led by protagonist Lena (Natalie Portman). Annihilation is definitely a film for those searching for answers to difficult questions, or for those looking for an intelligent exploration of a sci-fi, alien landscape. The film might be best compared to Invasion of the Body Snatchers. Though, Annihilation defies comparison. In both films, an alien invasion takes place. It starts from outer space, infiltrating Earth's atmosphere. Spores or something within the atmosphere weeds its way into the human body. And, the characters are forever changed. Does the alien invasion come in peace, or leave humanity in pieces? The outcome depends on the viewers outlook. However, both films end with humanity forever changed, but the story unfinished. What are the alien plans for humanity? Only a sequel could answer this question. After viewing Annihilation, this film fan was reminded of another horrifying science fiction film, Paul W. S. Anderson's Event Horizon. Both films involve a spiritual invasion. On the Lewis and Clark, the crew are invaded by the Devil. Their visions become nightmares. Their behaviours become murderous. And, they are definitely thrown into a living Hell. Within Annihilation, the researchers experience the opposite. They are inhabited by a God-like character. As well, they enter a landscape, almost like Eden. The flowers and fauna are more beautiful, than Earth's. The alien force creates trees out of salt, or salt water. And, the final setting almost looks like a garden. 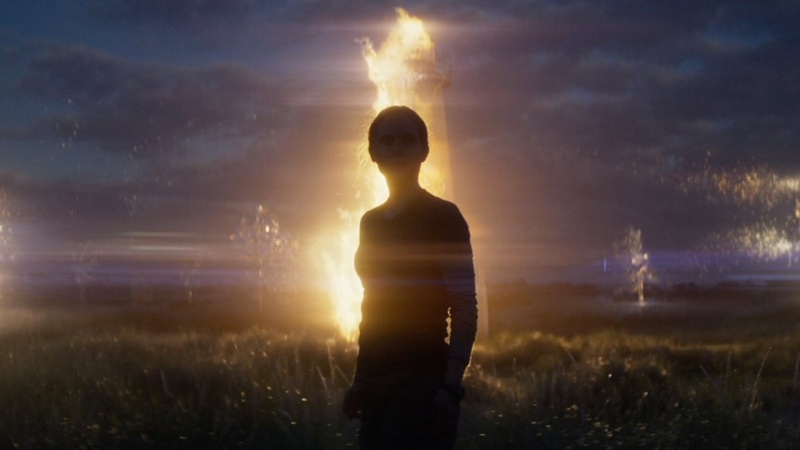 Characters, within Annihilation, are also inhabited by a force, changing them into something greater than themselves. In Event Horizon, characters are destroyed. But, in Annihilation, characters are enhanced. Both Event Horizon and Annihilation ask: what would spiritual possession look like. The answers and the outcomes are very different in both films. 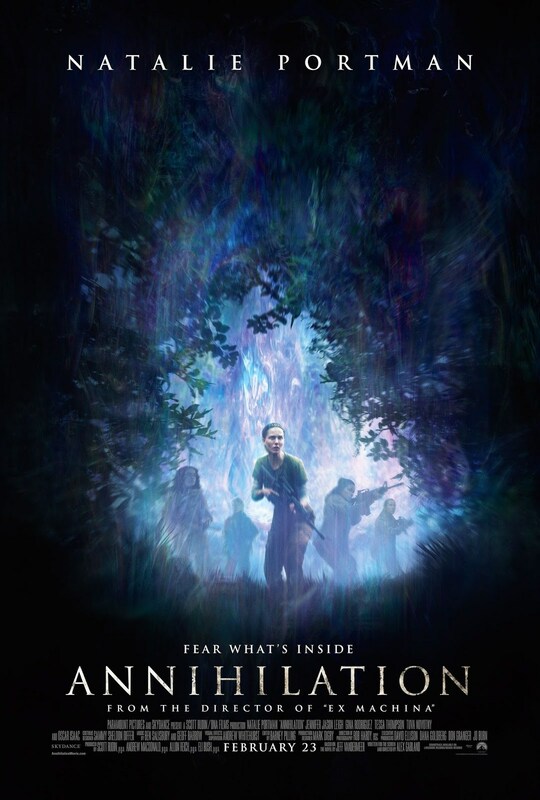 Though, Annihilation could simply be looked at as a sci-fi, action-adventure. After all, five scientists, or researchers are sent into The Shimmer, a small area effected by an alien force. They explore this new area, searching for survivors of other military squads. They find that the animals have been changed, by the alien invasion. One alligator is discoloured. 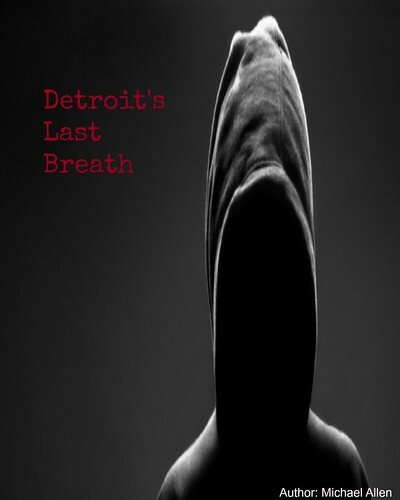 Another beast can utilize a human voice, to chilling affect. Meanwhile, near the meteorite's strike point, the area has been changed into a cave. The cave is constantly moving. Here, Lena has a confrontation with the alien force and even with a doppelganger. Film fans are encouraged to see the film for themselves, rather than reading reviews and ruining the film's many surprises. After Seeing a Truth - Paradise is Destroyed. Finally, it would be interesting to look at some of script's themes. There is this theme of infinity covered in the film. On at least three characters, there is this tattoo, on the left arm of a snake. It is eating its own tale - a symbol of infinity. But, why do several characters have this tattoo? Others do not. Late in the film, Lena interacts with a bright light, which almost looks like a galaxy or universe. To human understanding, the universe is infinitely large and incomprehensible. One of the character's, Dr. Ventress (Jennifer Jason Leigh), even mentions the "unfathomable mind." The characters are interacting with the alien force, which is infinite and beyond comprehension. There is only one character of this magnitude. Scriptwriters Alex Garland and VanderMeer are referencing God. Still, Annihilation can be interpreted in multiple ways. The theme of infinity, though, is mentioned often in the film and is central to the invading force's power. Annihilation is a film that has just been released in theatres, this week. Paramount Pictures has already sold some of the film's rights to Netflix. So, there will be lots of opportunities to see the film on the big and small screens. Though, this viewer recommends the larger screen, for a film of this magnitude. As well, Garland has crafted another great film, from VanderMeer's material. Annihilation asks a lot of difficult questions. What are we all doing here? This is one question of many. Some viewers will respond to this material, or be confused it. Either way, this title is an exciting and interesting sci-fi ride, into a new, fantastic landscape. The film can be compared to others. 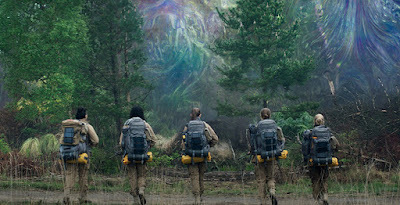 But, Annihilation is truly a unique take on the alien invasion genre as the film is often symbolic of a spiritual invasion. The shimmer in a character's eyes shows some of the film's brighter light, which might blind some but enlighten others. Overall: 8.25 out of 10. *there is also a theme of immortality, in the film. Lena can be seen reading The Immortal Life of Henrietta Lacks. Immortality is also mentioned early in the film, by characters. Does spiritual or alien invasion offer immortality? There is only one character who is considered immortal and infinite. Though, the same could be said of the universe.